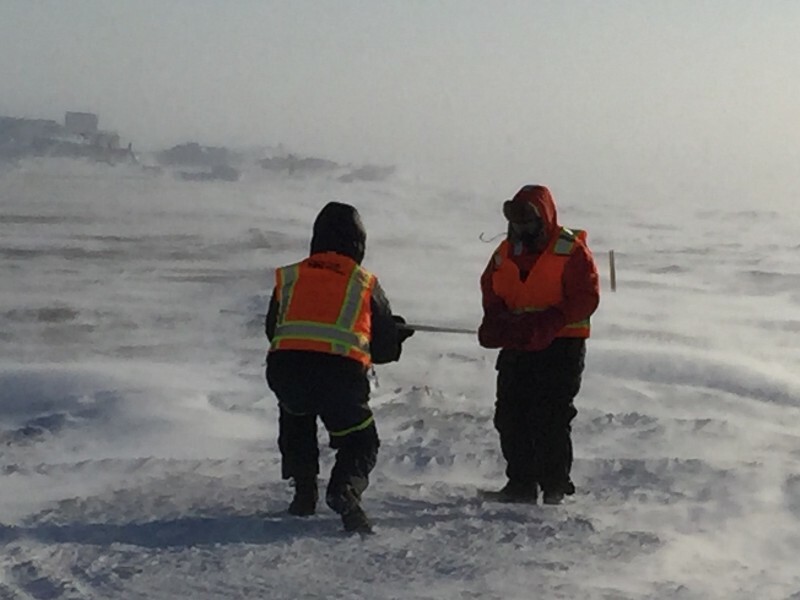 Doug (right) and Gijs (left) prepare to launch a DataHawk 2, in what can only be described as “challenging” conditions. The weather continues to be nasty up here. 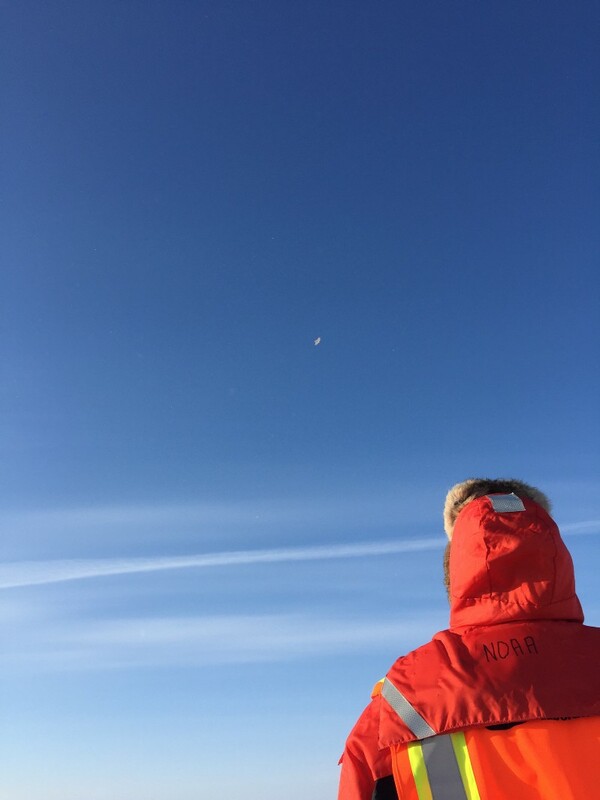 This morning at breakfast, the winds looked ever-so-slightly better, so we decided we would put energy into DataHawk flights today, while also continuing to obtain aerosol measurements from POPS on the roof top of the AMF-3. The AMF-3 and hangar as seen from the runway. The big plume of snow you see is coming from the USAF Caterpillar, outfitted with a gigantic snow-thrower to remove drifts from around the AMF-3. 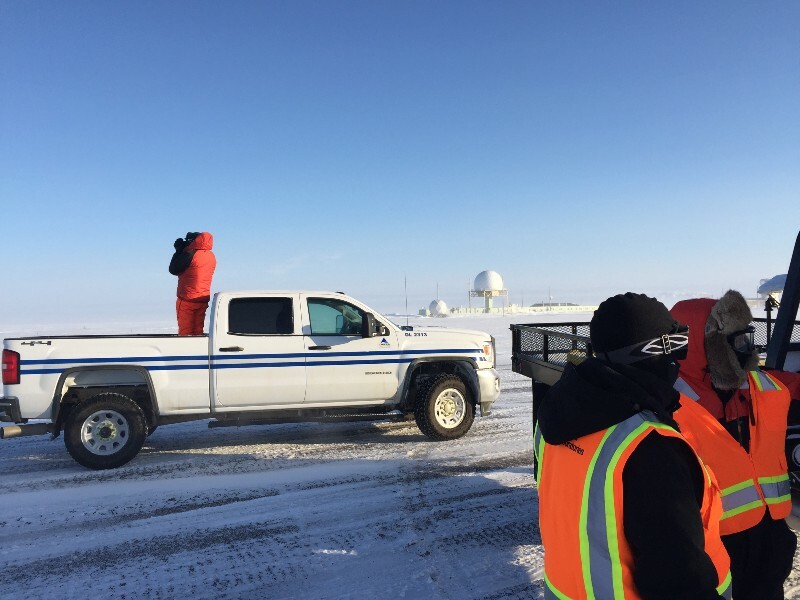 Sandia’s Al Bendure (in truck bed) keeps an eye out for bear activity while the team gears up for DataHawk flights. 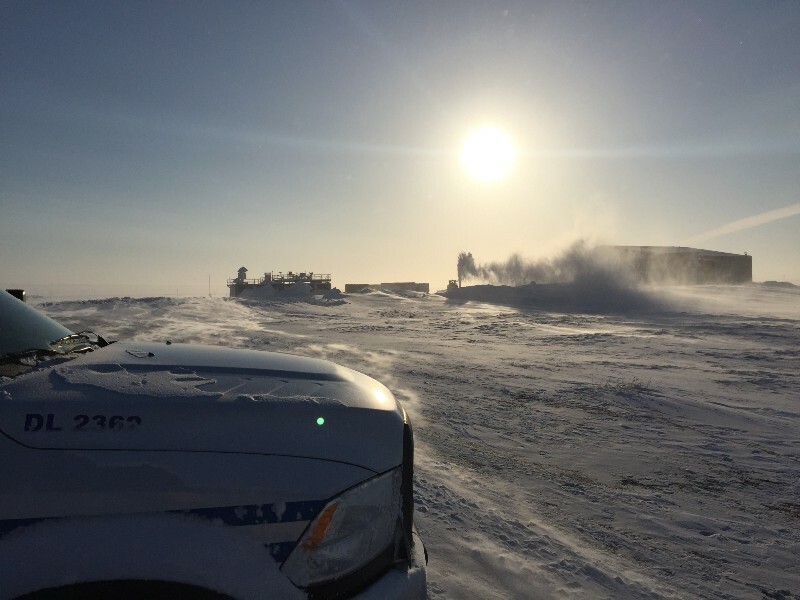 While it looks pretty nice and sunny, the winds were whipping at around 30 mph and snow was drifting pretty substantially! Nevertheless, we have already made substantial progress in evaluating the updated platform. From our preliminary testing it appears that the impact of the radar is substantially reduced, but has not been entirely eliminated. While the system can now handle the radar and keep itself up and running, we’ve encountered an issue where the radio stops transmitting. In this instance, the plane is still able to fly itself, and the pilot can take manual control of the plane to land it. However, it also will eventually result in what is known as a lost communications (or “lost comm”) situation. Since these planes fly autonomously, they need to know what to do when something goes wrong, and in the case of “lost comm” the plane should return to a predetermined holding pattern. If communications are not re-established within a given amount of time, the plane will terminate flight, meaning that it will initialize a local crash landing. Obviously, this is something to be avoided at all costs, so for the time being, we’re keeping the aircraft close to home. Doug keeps a watchful eye on the DataHawk flying overhead.